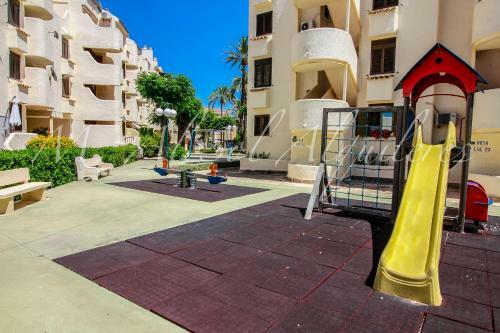 This family-friendly apartment complex is located near the old town of Denia, roughly 300 m from the attractive local sandy beach. An array of shops and entertainment venues are to be found nearby.This charming complex has a cosy bar, a restaurant serving delicious food, a pizzeria and a playground. A laundry service is also on offer and parking is available to guests arriving by car.The apartments are light, stylish and each come with an en suite bathroom with shower and bath, a combined living/ bedroom, a separate bedroom and a direct dial telephone. Further features include a kitchen with an electric cooker, heating, a hire safe and a balcony or terrace.In the lush green, landscaped outdoor area are two swimming pools with a paddling area and two tennis courts. Discover all I Denia can offer you!